Supreme Court 2015: The conservative justices’ love-hate relationship with textualism. The court’s conservatives love saying a law “means what it says.” Except when it means something liberal. The law doesn’t just forbid intentionally, explicitly racist housing practices, it also outlaws housing practices that have a racist effect. Photo illustration by Slate. Photo by fstockfoto/Shutterstock. Thursday further proved that this court has a love-hate relationship with textualism—the legal theory that statutes should be interpreted by their plain text and ordinary meaning. In King v. Burwell, three justices held that “an Exchange established by the State” should be taken to mean exactly what it says, despite strong contextual arguments to the contrary. Six justices, meanwhile, looked at context to hold—correctly—that Obamacare makes no sense if subsidies can only be made available to those who in live in states with exchanges. Yet in the day’s other blockbuster, the Fair Housing Act case, the justices who were so vehemently textualist in King changed their tune. The FHA case dealt with “disparate impact” discrimination—that is, discrimination that’s race-neutral on the surface but racist in practice. 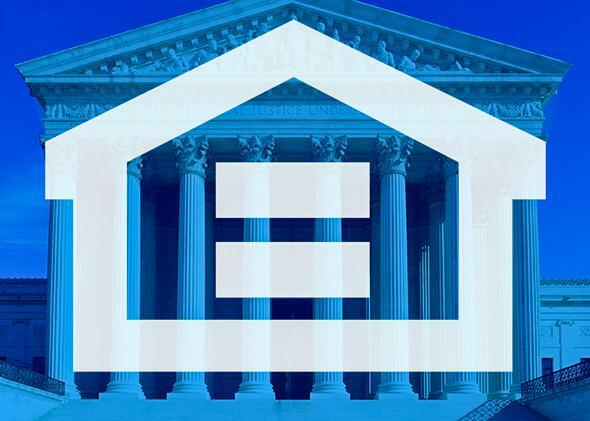 Every single circuit court to consider the question has held that the FHA allows disparate impact claims, and Congress has passed amendments to the law that implicitly recognize this fact. But conservatives have long argued that the law exclusively bars “disparate treatment” discrimination—that is, outwardly racist housing practices. On Thursday, Justice Anthony Kennedy and the liberal-leaning justices held, in a 5-to-4 decision, that the circuit courts were correct and that disparate impact claims can continue. The key to Kennedy’s opinion lies in the plain text of the FHA, which makes it unlawful to “refuse to sell or rent … or otherwise make unavailable or deny, a dwelling to a person because of race” (emphasis mine). That key phrase—“otherwise make unavailable”—is, as Kennedy notes, clearly a “catchall phras[e] looking to consequences, not intent.” In other words, the law doesn’t just forbid intentionally, explicitly racist housing practices—like, for instance, refusing to rent out an apartment to a black person. It also outlaws housing practices that have a racist effect—by, say, only providing housing subsidies in low-income black neighborhoods and not higher-income white ones, thereby perpetuating segregation. In a fierce opinion joined by his dissenting colleagues, Justice Samuel Alito protests this interpretation. But he doesn’t really engage with Kennedy’s argument that the law (and that crucial phrase in particular) means what is says. That’s because, if he did, he’d lose. It seems quite obvious that Alito simply doesn’t like the Fair Housing Act as Congress wrote it—so he seeks to rewrite it by altering one of its core provisions. That, of course, is precisely what Alito and his fellow conservatives accused the King majority of doing. In their hands, textualism is just as results-oriented as the interpretive methods they decry. Read the previous entry, by Dahlia Lithwick. Read the next entry, by Marty Lederman.